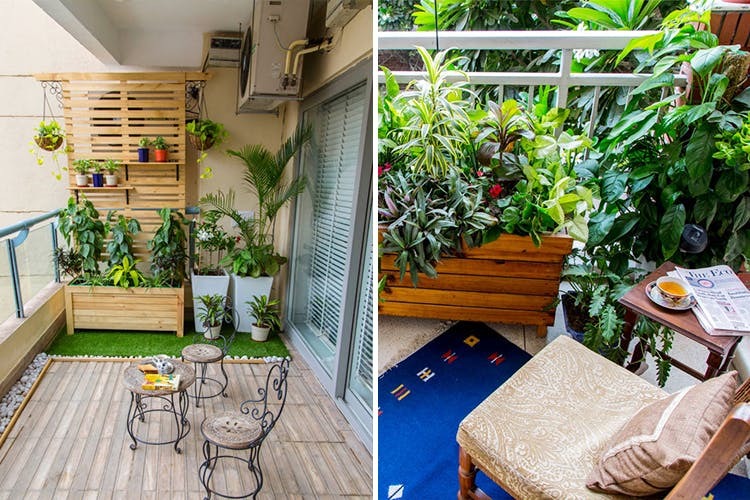 Gurgaon-based landscape designers, Studio Earthbox, take tiny outdoor spaces, be it a dull balcony or a neglected terrace and turn them into a green haven… planters, creepers, pebbles, path and all. Sunny balconies are a pick-me-up like no other but not all of us have the luxury of space. And the founders (two lovely, very understanding product designers) at Earthbox don’t think space is a problem at all. They optimise whatever little spot you can give them and fill it with ladder gardens, self-watering planters, railing pots and hanging greens. This approach to urban gardening makes us feel like our currently-unloved 1BHK deserves so much better. Of course, the before-after pictures of their makeovers are really promising, and we have a reason to believe that they’re indeed wonderful at what they do. If you’re more hands-on than that, you can also just buy their handcrafted garden accessories and get to work yourself. Browse through their collections on World Art Community, Pepperfry or Mojarto and get kicking? We wish they also had an offline store.